Iraqi Oil Minister Ibrahim Bahr al-Uloum has been temporarily released from his post amid a dispute over the government's petrol pricing policy. He is to be replaced for 30 days by Deputy Prime Minister Ahmed Chalabi. Mr Bahr al-Uloum had publicly objected to the Iraqi government's decision this month to raise petrol prices threefold. Fears of severe shortages, prompted by the closure of Iraq's largest oil refinery, have led to long queues at petrol stations in Baghdad. The refinery in the northern town of Baiji has been shut since last week following death threats to tanker drivers. A ministry spokesman told reporters that "production in the north, centre and south is about to suffocate". The closure has jeopardised power supplies across northern Iraq and is costing the ministry $20m (£12m) a day. The ministry said it hoped the Baiji refinery would be back up and running within days. "The government has relieved Bahr al-Uloum of duties for 30 days and put in charge Mr Chalabi who heads the energy council," an official told the AFP news agency. "The decision was taken because of Mr Bahr al-Uloum's objections to the early introduction of higher petrol prices." Mr Bahr al-Uloum, the eldest son of independent Shia cleric Mohammed Bahr al-Uloum, is a petroleum engineer who previously served as oil minister in the first post-war cabinet between September 2003 and June 2004. "I object to the decision of putting me on leave and the mechanism by which it was done after I objected to the government's decision to raise fuel prices," Mr Bahr al-Uloum told reporters late on Friday. The Iraqi government cut subsidies on petrol earlier this month shortly before the International Monetary Fund (IMF) backed a new $685m (£395m) loan to aid its economic reconstruction. Protests broke out throughout the country as the price of petrol tripled from 50 to 150 dinars ($0.03 to $0.10) a litre. 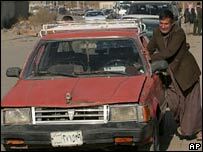 Although billions of dollars have been spent on infrastructure since Saddam Hussein's regime was toppled, fuel and electricity production have not reached the levels maintained before the invasion. Estimated pre-war level of crude oil production: 2.5m barrels a day (peak). Estimated pre-war level of crude oil export: 1.7m to 2.5m barrels a day. Figures for September 2005 based on incomplete data and represent averages for approximately half the month. All data as of 14 December 2005.